The Worst Service in the UK?! 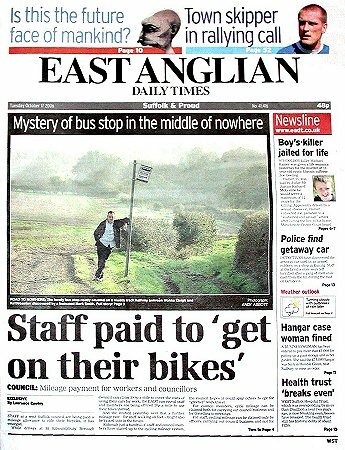 News of our mystery 'bus stop' hit the media yesterday with the East Anglian Daily Times featuring the story on their front page (and all of page 3) and the BBC on its evening edition of Look East. Anglia Television have also visited the site and are due to broadcast soon. 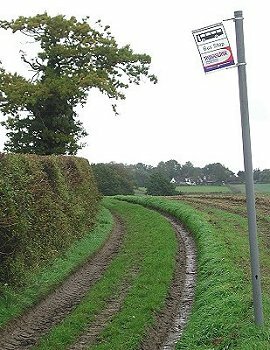 THERE are more than 6,000 bus stops spotted around Suffolk - from the hustle and bustle of urban sprawls to the peace and quiet of small rural routes. But, of all those, it's a good bet there isn't one in a stranger or more secluded location than the one that keen mountain biker Mark Smith discovered while out on his trusty cycle. 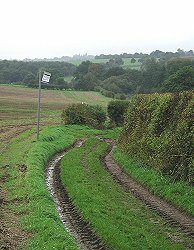 For this stop sticks out like a sore thumb in the middle of a Suffolk country track some 800 metres from the nearest road - and one suspects that, no matter how long you waited, a bus would never pass by. Mr Smith spotted the mysterious Suffolk County Council sign during a ride on the track, between Kettlebaston and Monks Eleigh, last Friday afternoon. "Sure enough, there it was. I assume that someone has put it up as a mickey-take but they've done a very good job on it. I can't believe that a bus company would have put it tip. It looks official - it's in better nick than half of the real ones. When 1 got home 1 took my son Dominic down to see it because he couldn't believe it." Mr Smith, 43, from Bildeston, added: "It's a track I use once or twice a month but because of the recent bad weather we haven't used it for about six weeks. "The sign has appeared since the summer - it was a pleasant and intriguing surprise. There are tyre marks that go out of the tracks, go round it and then back on to the track so it seems that tractors are avoiding it. "Grass is growing around the base and it's not moving anywhere, so whoever has put it in there has done it well. "There's no way that a bus could go down there - you couldn't even get a car down there. If the bus company has gone down there and put it up the world really has gone mad." A Suffolk County Council spokeswoman last night said: "We're baffled. It's obviously not a bus route. "It is one of our bus stops, but it's an old one - they've changed since then and this one appears to be a pre-1998 design. "If anyone has got any idea as to how long it's been there or or how it got there we'd love to know." 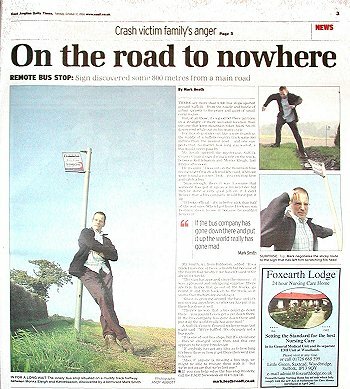 Also if anyone is missing a bus stop, we might be able to reunite them with it - but we're not aware that we've lost one."